Forget the old, rustic log cabins. 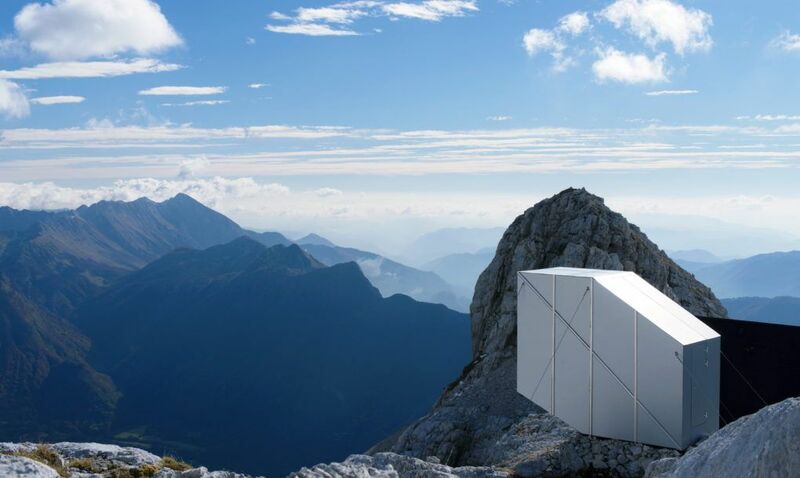 Mountain shelters are now designed by ambitious architects who push the limit of what is possible with stunning, modern creations. Iceland is getting geometric tent-like shelters and glass northern lights viewing platforms, Idaho is using cozy yurts, and Slovenia has this thin-looking, modern cabin perched on a ledge. 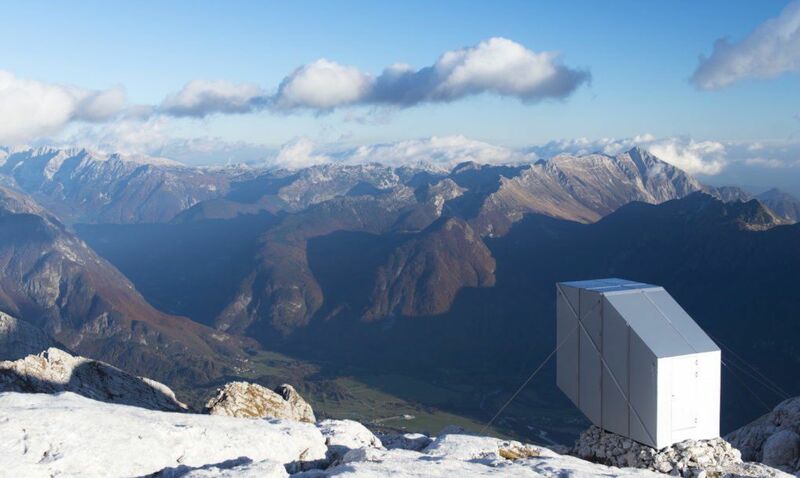 Designed by Slovenia-based architecture firm OFIS arhitekti, the Kanin Winter Cabin is made of wood and was designed to withstand the very harsh weather conditions (snow, heavy rainfalls, strong winds, and possible earthquakes) of the Western Julian Alps. The cabin was not directly built in the Kanin Mountains as it would have been much too challenging. 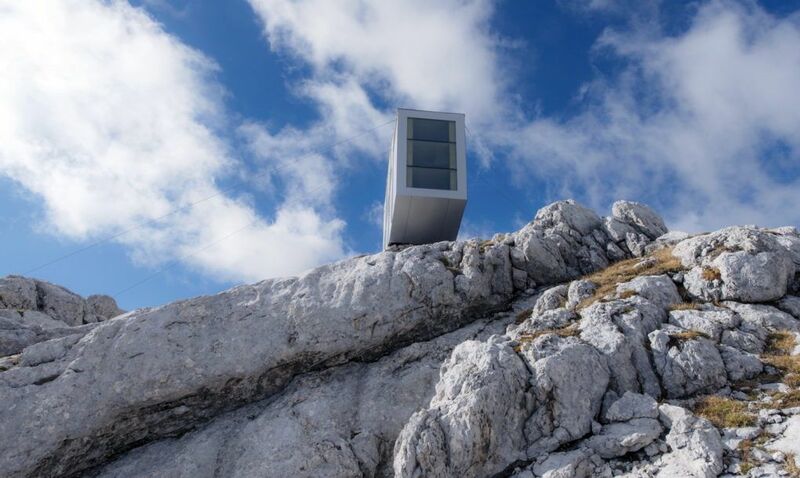 Instead, it was prefabricated and the Slovene Armed Forces helicopter crew transported it to the summit. The location was chosen for its remoteness; its incredible views of Triglav, Soca Valley, and the Adriatic Sea; as well as ist popularity with hikers, climbers, cavers, mountaineers, etc. Nine people can fit in this narrow cabin that seems to be hanging in the void. Thanks to a large window facing the valley below, those who reach this shelter will enjoy sweeping views of the valley below and the surrounding mountains. Although it may not seem like it at first, the Kanin Winter Cabin is very stable. That said, those with a fear of heights should probably find a more suitable spot to spend the night.